The Hologram buzz is all around and has made an intense impact in the entertainment industry. We saw extensive use of this technology in Star Wars wherein the hologram of Obi-Wan interacted with Princess Leia that wowed the audience. In addition, there have been holographic fashion shows in New York, Hamburg, and Beijing. The great Michael Jackson and Tupac Shakur, and JC Jacobson were brought back to life for a one night show using this technology. But can it be the new channel for "Event Advertising"? Trade shows, events and conferences involve people from different sectors and walks of life who show up and network together for a shared interest or common goal. Thus its very important to have an engaged audience and attentive attendees if you want your event to be successful and not a wasteful gimmicky venture. So the important question every event organiser or booth owner needs to ask themselves is How can you attract interested individuals to your trade show/booth and communicate with them in an effective manner? As humans, we are all visual thinkers. In fact, 75% of the neurons in our brains process visual information. The old cliche of a picture being worth a thousand words continues to hold true in the digital world and in the business context. Welcome to the world of Holographic telepresence technology a powerful visual channel that provides a solution to all your event related pain points. Holographic telepresence which was a futuristic technology that existed in sci-fi movies and used extensively by the entertainment industry is now within the reach of event marketers looking to make an impact with their brand experience. It has gained importance as the new form of advertising solution in trade shows and conferences. Interactive holograms are able to create a 1:1 human user experience in a sea of competition. CGI animation provides expressions, gestures, and emotions to create a memorable experience in a crowded room to appeal to any attendee and draw them into your booth. The biggest advantage is for enterprises using 3D presentations for conferences and meetings. Content is tactile and interactive and people can see the presenter even though he is not present in reality. Participants are beamed from multiple locations into the meeting thereby improving training, design, and visualization. The effect is engaging, exciting and fresh. Using holograms in meetings, shows etc. can enthrall attendees and forge lasting, meaningful impressions. The new hologram technology is now being used by a number of marketers to promote their products by creating stunning lifelike promotions. The projected image can be viewed from any angle, and as the user walks, the object will appear to move to make it seem very realistic. Watch this technology in action at the esteemed Audi cup where the world’s first ever holographic press conference was held. The benefits of this technology were amply demonstrated when it was announced that collectively, Jürgen Klopp and Diego Simeone were able to save a total of 5,300 kilometers of air travel and some 15 hours of travel time. There has been a large-scale use of the holograms in a number of ad campaigns and only two or three holographic displays are enough to gain a customer’s attention. Some of the most popular brands that have used hologram tech for display include Samsung Coca-Cola, Ferrero. Ford Motor Company uses it to create prototypes of their vehicles. Aquafina and Pepsi created an event in Chicago that allowed fans to see and play baseball with the holographic image of their idol, and could then share the same on their social media. Holographic telepresence technology is also used by airlines where the optical elements are used for course plotting by the pilots. A holographic image of the cockpit instruments floats in front of the windshield helping the pilot to keep an eye ahead while reading the devices. Sony Electronics uses holographic applications in their digicams wherein a holographic crystal is used letting the camera sense the edge of the subject and distinguish between it and the background. Holograms are today being used in industries such as architecture, entertainment, healthcare, etc. With such infinite scope, this futuristic tech can be a globe of the virtual world. It requires no set-up, and content creation is easy. It is the new form of a classy on event advertisement with a fully integrated 3D projection platform that displays images that is very realistic. By going beyond the limitations of traditional salespeople, a self-service interactive hologram is able to effectively communicate and deliver information to any attendee. When it comes to using this technology, event marketers need clear marketing goals and ask themselves how the hologram fits into their marketing strategy i.e whether they need to educate, convince or attract customers to ensure that the event stands out and connects with the target attendees. 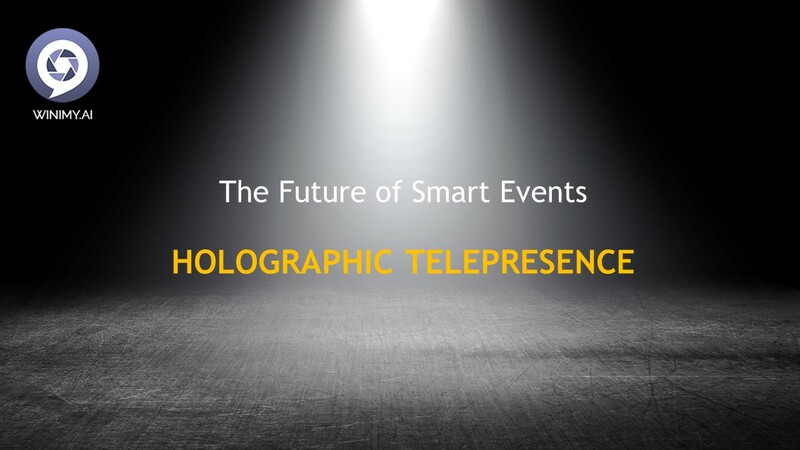 The future is smarter and the future of events is definitely going to be holographic. Write to us at [email protected] to see how 3D Holograms can make your next event the talk of your industry.